ВАЗ 2108 – тюнінг, ремонт і експлуатація. Для хорошого старту неможливо обійтися без хорошої резини. Регламент в драгрейсингу дозволяє будь-яку резину але з допуском до використання на звичайні дорозі. Тобто або DOT (американський допуск) або E (європейський). Тому суто драгові сліки мені не підходять. Провівши короткий огляд доступних варіантів, зупинився на сліках Mickey Thompson ET Street Radial II - P205/50R15. The ET Street Radial line is specifically designed for modern performance cars including sport compacts, Mustangs, Corvettes, Vipers and others that require bigger wheel diameters for brake clearance. 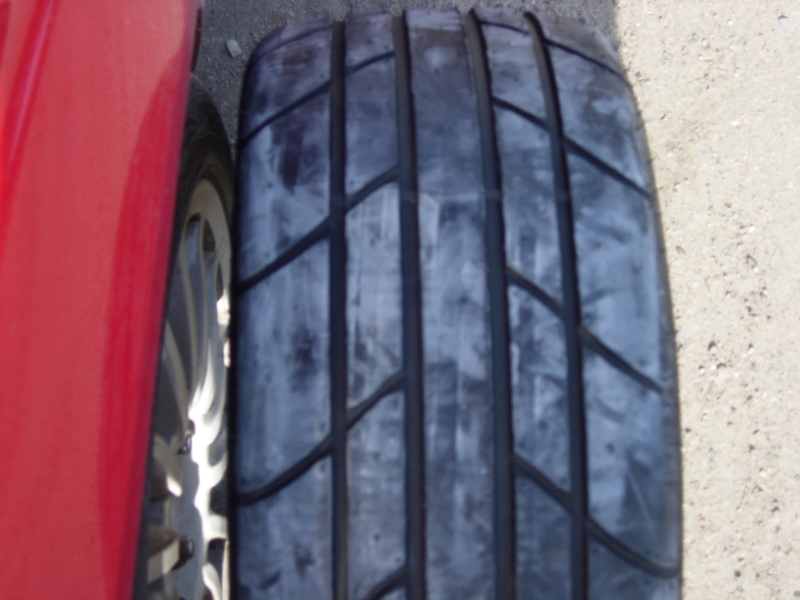 CAUTION: It is not recommended that radial and non-radial tires be mixed on the same vehicle..
All Mickey Thompson ET Street Radial tires are designed for drag racing use. 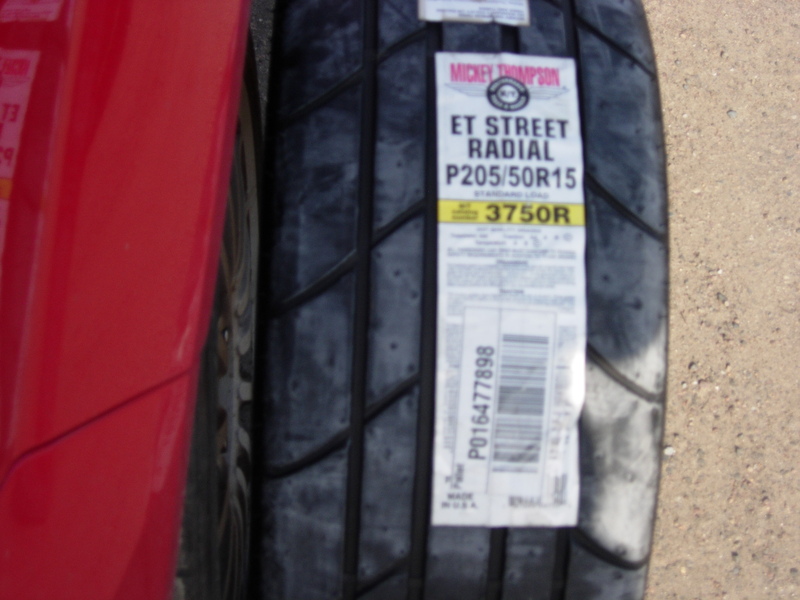 While Mickey Thompson ET Street Radial tires meet Department of Transportation requirements for marking and performance, they are recommended for DRY PAVEMENT USE ONLY. Через посередника купив в США 2 шини. 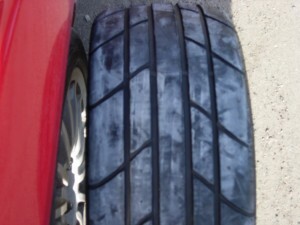 Question: What kind of burnout is recommended with Mickey Thompson slicks? Answer: 1. Automatic transmissions: 1st pass or two, do a fairly hard burnout. After that a light burnout should be sufficient. 2. Standard transmissions: -Stockers- No burnout or short, dry burnout is sufficient. Super Stock or Comp cars- light burnout, haze tires and stage immediately. Generally, tires work better with a light burnout, rather than a hard burnout. This also increases tire life. Note: ET Street™ tires may require a fairly hard burnout on the 1st and 2nd pass to break in. Note: For more information on M/T slicks please consult M/T Tech bulletin # 1. Проїхав з ними вже 3 етапа по драгрейсінгу. Наразі найкращий результат получається якщо їх легко прогріти, і відразу стартувати. Необхідно увійти, щоби відправити коментар.